I don't know what's gotten into me lately, but I'm doing all sorts of things (stamping wise) that I don't normally do. I guess I should just ride the wave being that it may stop any time now and I'll go back to my basic formula and Unity stamps. Not that there's anything wrong with that. But it's kind of cool to see that I'm capable of stepping outside my box. This card was made using the Faux Grid Technique. It was the Monday technique challenge on SCS. It's pretty simple, you just draw lines on the paper so it looks like your image is on a grid. This image is Penny Black. I got it in an image swap so I don't know what it's called. 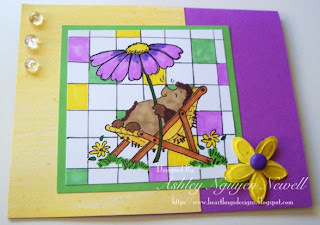 I love these little hedgehogs! They are so cute! The yellow patterned paper is Bo Bunny. I embellished with some dew drops, a Prima flower, and a brad. Pretty simple. This is awesome Ash! You did a great job! You are expanding outside your box with creativity! Wow this is amazing! Love the colors and your faux grid rocks. Cute Ashley! Keep having fun using those non-Unity stamps! Love to see you expanding!!!! Great coloring too!